As a novelist who has spent years crafting and refining his intense and oft outrageous “Demon Dog of American Crime Fiction” persona, James Ellroy has used interviews as a means of shaping narratives outside of his novels. 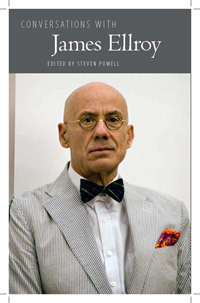 Conversations with James Ellroy covers a series of interviews given by Ellroy from 1984 to 2010, in which Ellroy discusses his literary contribution and his public and private image. Born Lee Earle Ellroy in 1948, James Ellroy is one of the most critically acclaimed and controversial contemporary writers of crime and historical fiction. Ellroy’s complex narratives, which merge history and fiction, have pushed the boundaries of the crime fiction genre: American Tabloid, a revisionist look at the Kennedy era, was Time magazine’s Novel of the Year 1995, and his novels L.A. Confidential and The Black Dahlia were adapted into films. Much of Ellroy’s remarkable life story has served as the template for the personal obsessions that dominate his writing. From the brutal, unsolved murder of his mother, to his descent into alcohol and drug abuse, his sexual voyeurism, and his stints at the Los Angeles County Jail, Ellroy has lived through a series of hellish experiences that few other writers could claim. In Conversations with James Ellroy, Ellroy talks extensively about his life, his literary influences, his persona, and his attitudes towards politics and religion. In interviews with fellow crime writers Craig McDonald, David Peace, and others, including several previously unpublished interviews, Ellroy is at turns charismatic and eloquent, combative and enigmatic. Looking forward to reading this one immensely Steve!